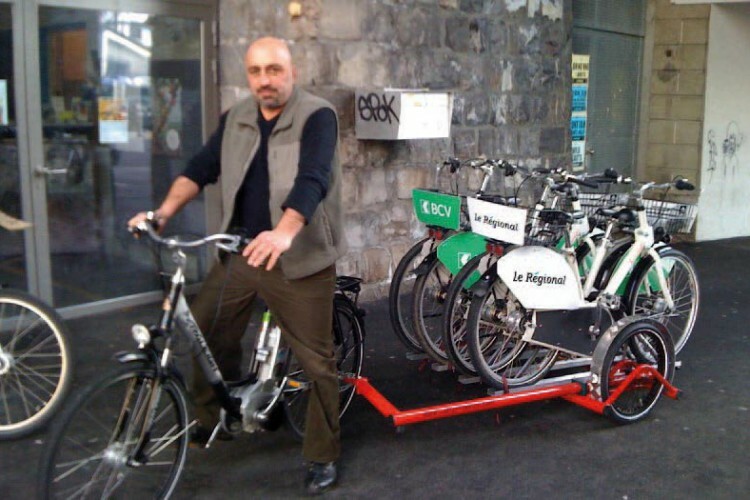 500 rental bikes for the Swiss operator Velopass in various locations. The Design: „Paper Bicycle“ – a patented frame design with various special adaptions for public cyclling operations. A unisex design with a low step-over main frame support using a steel frame with an integrated chain box. 26“ wheels with the innovative seemless internal gear hub NuVinci (360% ratio) and Shimano Rollerbrakes. Hub dynamo and fail safe cabling and wiring. The bikes are also secured against theft using special safety screws and nuts. Sensor-controlled LED lights automatically turn on whenever needed. The frame was customized to fit their own bike terminals „Bicincitta“. The customer also uses the bicycle trailor „Elephant“ to distribute up to 4 bikes at a time. bicycle trailor „Elephant“ to distribute up to 4 bikes at a time.